Lots of changes! If you have read this before, read it again. Max Evo Cards: This depends so much on what the card is and how many times it was maxed evo's and when. There's no way I could list each combination here. If you have a specific trade in mind with one of these, I will be more than happy to help. These are averages and are not the rule, everyone is entitled to trade their cards for any amount of HP or Cw as they like. At the moment, Cure water is being sold at 2-3 per HP. Especially with Holy Wars Coming Up its not going to be as high. Whatever their level of rarity in their FF is, move it down one level down for Treasure Cards. * I know that in my trade offers, I offer more for these items, but that is bc I can afford to pay more bc those are cards that I want at the moment. Don't be afraid to do the same if it something you really want. Also, where it says hp below, it can be substituted for cw in some cases, but it depends on the trader. Because cw is more available after every boss battle and hp is not, some traders may believe that hp is more valuable. The closer you are to Holy Wars, the more value hp will have. Whereas, the closer you are to a quest event, the closer the value of hp and cw will have in the marketplace. I have a clean Sukteh SR and I am looking to trade down so that I can get a good ATK deck. What would a fair and good trade be? I am playing man and was wondering what best deal would be for me. Any hint advice would be good. No matter what anyone tells you, it is smart to trade down for your SR and SS single cards, Why? Bc the chances of you being able to make trades or buy 10,000 rage medals to get more of that card are slim to none. So it depends on how new you are. If you want an almost full starter deck of cards, you can get it with the Sukteh or any other SR. What you can ask for is 2-3 sets of evo'd HR cards (Those are rare cards that have been evo'd to make a high rare). If You just need one good card in your deck you can ask for an Evo'd SR (card that was evo'd using 4 High Rares). But this depends on the card, how much power it uses, & its skill. Also Max Evo's may be harder to get with single SRs bc normally ppl that you are trading are already using them in their deck and one SR wont replace that unless they have 3 others that are the same as yours. "Why do I want these cards, if they only raise themselves? Why not an attack all skill? That's better after all"
No no no! You're so very mistaken. Let's look at some of the cards in my deck. The average person that is level 60 has a deck of each card being approximately 13000 atk & def. 13000 x 5 = 65000 total avg attack without boosts. Valk's gods attack skill is 15% to all gods. So let's say you have all god cards at around 13k average attack, that's 65000 avg attack x 15% boosts = 9750, but again you would have to have all god cards! Now before you get hasty and say that's still higher than it is with Hermes, I'll correct you. Hermes boost is for attack and def! So if we added those two Hermes boost together 5722 + 5499 = 11221! Which beats Valkyrie. And more suitable most other SS RARE Evo bonuses with the single realm attack (or just defense) boost. Now let's take another Evo SS RARE, but with an attack all boost. Nobunaga has attack boost all but only 10% for each card. 4max Nobu is at 13k, if u have 4 other cards around the same (totaling an average of 65000), it would be a 6500 bonus. But again this bonus is only in attack. Now what do you do with this information? You start trading smart! I was able to get my 2 of my Hermes from two separate people using the much over rated card Michael with a Great attack all boost. Most people who have fully Evo maxed Mike in their decks have an average deck with an attack of 16500 per card. So that's 16500 x 5 cards = 82500. So 10% of that is 8250. But again this is only in attack! Compared to Hermes which gives your deck a total boost of 11221 total between both decks. Now lets look at Hermes, 4-6 max attack is 19k, So that totals 95,000. One card going off is 5722. Totaling a total attack of 100,772. Hey there, while this is a pretty helpful article, there are a few things I'd like to take issue with. First, in the current market, hp is not valued as equal to cw. Thus, saying that the hp:cw ratio is 1:1 is almost wishful thinking. You may want to clarify that most people place more worth on hp than they do cw. (except, of course, during events)it is also highly unlikely that you will find yourself buying hp at 45/55k, so you may want to review that section. Also, your information on Knight Luci is a mite outdated, in my opinion. Her value's dropped quite far recently due to the passing of "new card hype". Her current market price, if I'm not mistaken, falls closer to the range of 4-5hp. Although, I appreciate your point of view, on challenging me on issues. You have brought up some very valid points that I would like to clarify with further explanation. As far as hp being more valuable than cw goes, I will agree that some may think so, depending on the trader. During the time of Holy Wars, you are correct. Cw will have little value right before or after this event. But during the duration of event quests (much like the one coming up), CW becomes more in demand. However, given the fact that CW is always available after a boss battle and hp is not, I will change this section accordingly. As far as Luci goes, there have been several instances this week, that I have sold her for that amount. I refuse to drop Luci down to the 5hp price that I was selling a hild at, because, she is way more valuable. As stated as disclaimer when you first began reading this, these are in fact MY OPINIONS. Do I think her value will drop to around 4-5hp? Perhaps, depending on the emulators. However, RoB is finally taking steps to keep a better eye on the influx of the referral bonus, So we shall see. With Regards to Hermes, you can't treat that card as a solely attack nor only defense card because you're not buying two separate cards. With regards to Valkyrie comment, lets put that to the test. 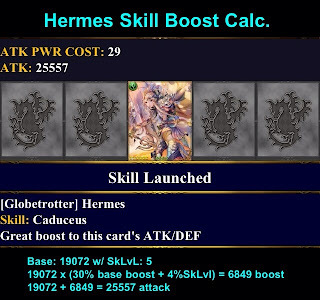 Now lets look at Hermes, 4 card max attack is 19k, So that totals 95,000. One card going off is 5722. Totaling a total attack of 100,772. I fail to see how that is not more than Valkyrie. I can waiver to your side on the hp/cw issue. However with regards to Hermes, I firmly stand tall with my previous opinion. Very good point with Valkyrie comment Zuks! But until u brought this to my attention, I have to admit I thought the same way as Pacis. You've swayed me though. I've been doing some further calculations with mix god decks where it isn't just Valk or isn't just Hermes. 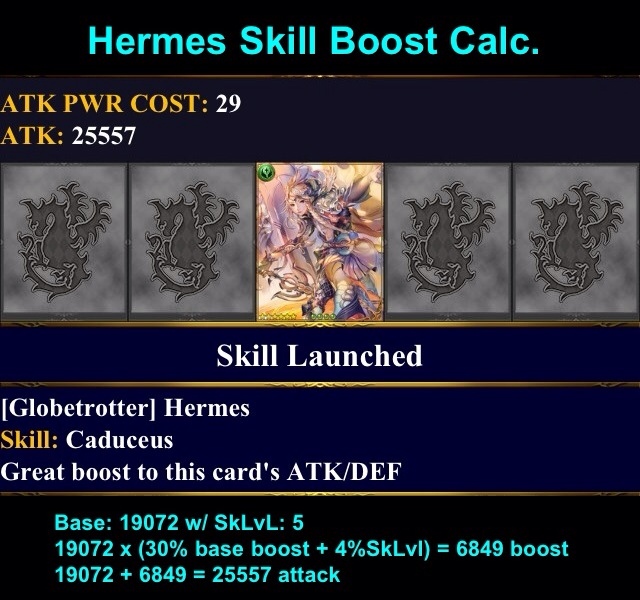 These calculations were with just those two skills going off and Bc Valk's attack is so much lower than Hermes, Hermes deck seems to come out on top. So I'm guessing when a skill isn't as helpful, Rob makes up for it with giving it a larger attack or def. U R so right about the FP! All others fail in comparison. Do either u or zuks know if there is a Massive Boost to all Gods attack skill coming out? I looked under God's card and Skill info but didn't see one as of yet. Great blog though Zuks! Appreciate all your work! Well, I do see your point. My main beef with your Hermes article was that the way you worded your explanation might have caused newer players to believe that they were getting a total boost of 11221, rather than a boost of 5722 when attacking and a boost of 5499 when defending (I hope I'm making sense). This might cause them to believe that they would get a 11221 boost when attacking, which would be false information. Rather than showing how the two boosts together are worth more than Valk's, you may want to word it such that the emphasis is more on the fact that Hermes is more versatile than Valk. I hope you can understand what I'm trying to say, it's 2am here and I'm nodding off. "Well, I do see your point. My main beef with your Hermes article was that the way you worded your explanation might have caused newer players to believe that they were getting a total boost of 11221, rather than a boost of 5722 when attacking and a boost of 5499 when defending (I hope I'm making sense). This might cause them to believe that they would get a 11221 boost when attacking, which would be false information. Rather than showing how the two boosts together are worth more than Valk's, you may want to word it such that the emphasis is more on the fact that Hermes is more versatile than Valk. I hope you can understand what I'm trying to say, it's 2am here and I'm nodding off. Also, on a separate note, can't wait for Legend Gabriel. Absolute boost to Gods ATK/DEF <3<3<3"
Np, I can see how that can be misconstrued. But yes, Legend Gabriel! Great Card! Wait that remind me I forgot about the Legend Cards! Adam to answer your earlier question there is one card with a Massive Attack Boost to all Gods called Shiva. But it is in the Legend Category because it's skill percentage is so much larger than that of Andromeda who has Massive Boost to Atk & Def of Gods. But again this is of things yet to come. Oh that's whats up right there. Hey noticed you changed your background pic to the site. Who is that? Looks like Lance, but I see 5 circles at the bottom. It's the stage 5 evolved Lance. In the Japanese Version, Certain cards can be enhanced up to 5 levels. Actually the Bahamut Background you see when your game is starting up, is the 5th stage Evo image in the game. Since we both know the real reason of the influx is due to the emulators. Actually never mind about going till level 10. These personal CWs and HP r popping up after level 10 also. Hopefully the prices will go down now. Someone is offering me an 8MAX Valk for my Sutekh. Is this a fair trade or should I be getting more? Thanks. Heh. Just got a few offers. A clean Hermes + 5 HP or a flat 200 HP. @Zuks - Let me start by saying this is an excellent blog and I really appreciate the time and effort you've put into providing quality RoB info! I'm commenting because I have concern that translated skill chart numbers are inaccurate. I've only been playing for a week or two, and I've been crawling the interwebs for good, accurate information... However, I'm wary of stuff like this that's been translated since I have noticed discrepancies between the US and JP versions. My primary example was witnessed firsthand: the Archive bonus that supposedly takes 3 seconds off your stamina recharge in the JP version actually only takes ONE second off in the US version. So... with that in mind, what are your thoughts on this in relation to the skill chart -- that is -- how is it possible to know what any of the stat boosts actually are, if there are known differences between the two versions of the game? Or do you have anything else to back up this info? My pleasure! and wouldn't it be nice if we actually got a 3 second archive bonus per level! Suddenly only being level 3 on the max bonus, doesn't seem so bad. In answer to your earlier question, yes the skill chart is correct. I and numerous other people have tested it throughout various decks. We made sure to tests these decks with other boosts as well as alone. This way non skill boosts, such as order bonuses (Attack/Def leader & Order Realm Boost), Realm Bonuses (2% bonus on cards in your realm), Morale Raised through Victory Bonus (10% raise for 10 mins after victory) and any others that I'm forgetting at the moment while answering this question, were all taken into consideration. All the boosts are taken from each cards base attack/def and added together cumulatively. 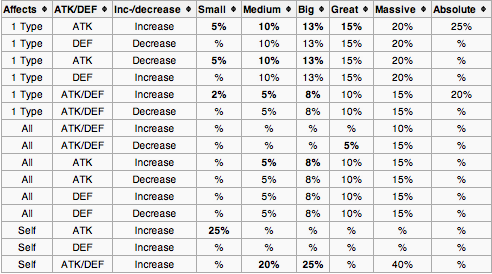 I will note in some cases the boosts came close to something like 19.4% when the chart says 20%. But overall the chart is a great guideline and indeed correct for this version of the game. Zuks, i just wanted to let you know your blog is awsome. It really helped me understand the game a lot more. I do have a question regarding prices on Rares. I'm currenty lvl 48 a like over half of my card inventory is filled with rare cards i don't use so im trying to sell most of them. I do have quite a lot of EVO's HN to Rare, but i dont know what to do with them, should i use them for enhancing? And secondly your chart up here for prices made it a bit more clear what i can ask for a rare, i made myself a list what i would want to have for my cards. Some i will let for 2hp others for 3hp but how much should i ask for a MAX enhanched Kratos/Garmr or Agni in UE state? What would you say a 2nd form Hild enhanced to lvl 8 is worth? Inimari - Rares even if max enhanced are still usually only worth 3hp. U can try 4 but I doubt u will get it with an experienced player. J.C. I would say the same price as 2 hilds. I've sold a few this week for 10hp each. Only have one left. Some people try to lowball me, but they're expired and worth more now. I have a join question I have a max who/enhanced Ancient elf, how many SR cards could I request for a fair trade? I'm new and just started two weeks ago and don't want to be low balled on this card because I got it and other cards in a trade for a non evo bahamut. thanks for the help in advance. That's actually not a high SR. If u could get 3 good Hrs for it, that would be great. Or around 70hp. Thanks great article. I'm new to RoB and I'm really enjoying it. I'm trying to understand the value of teh cards and do not want to be ripped off in trades. I have been offered 2 rares (Reshef, Elder Vampire) and a high normal (Warrior)for 5 HP and 2 CW. Also I have been offered yinlong (rare) for high gunner (rare). Are these fair trades? On a side note do you have any advice for a beginner on how to build and acquire cards for their deck? My advice would be to stay away from the legend booster packs, there not worth it. I spent $500 and on got 1 Sr, 1 SSR, and 1 legend card. @ Michael: there's no quick trick or single golden rule for making out big on trades. Like the stock market, u need to sell when cards r at high value and gather them when they're low. The only way you can acquire this expertise is to watch and Learn. Best place to watch is the supports of whoever is in the legend spot for battle ranking. Like the ticker at the NYSE, that page is always beaming with current trade stats. So that would be a good place to start. Also try the classifieds sections of this blog from the menu header above. Take a look at what trades r being made and how ppl r going about making them. Aloha! :) I just got a hold of 5 clean hilds. should I try to sell them now? turn them into its final form? or could they translate to a super cool card trade (if so, what would u suggest)? Hi. My IGN is CrossXcalibur. I wanted to ask a quick question regarding cw values with the upcoming event. I have about 300 cw's and was hoping that demand would increase their value to a point that I could flip them for hp. What is the usual trade value during a cw heavy event to hp. I have noticed that some are already beginning to trade for a flat 1:1. Will they go up from that? Thanks!! !